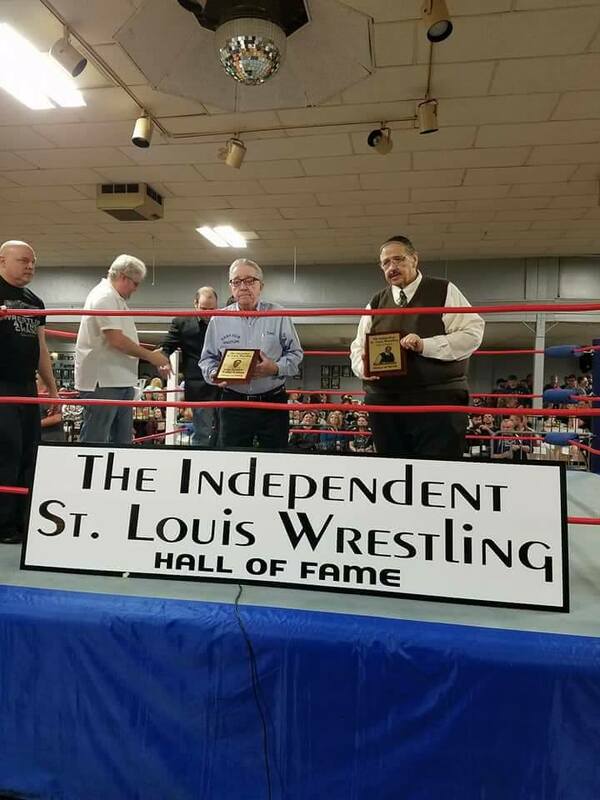 The St.Louis Independent Wrestling Hall of Fame was founded to pay tribute to those that have contributed to the Independent Wrestling business. 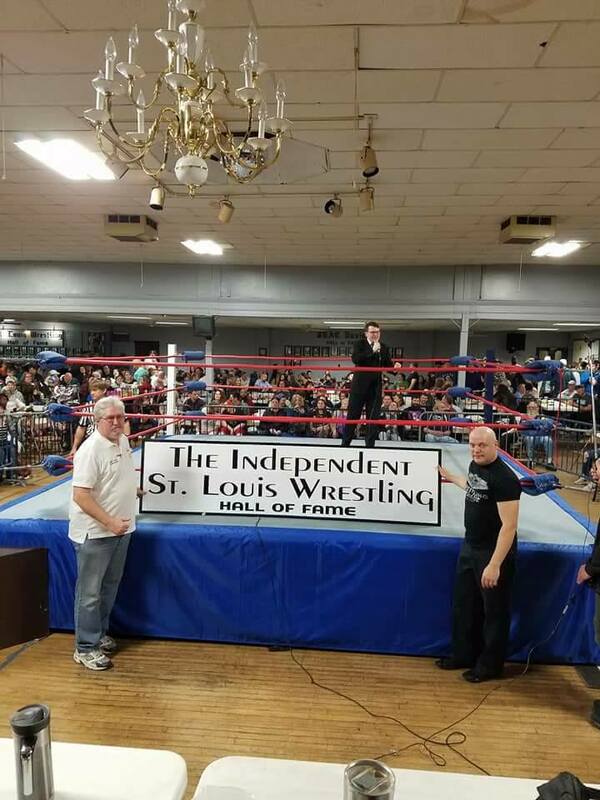 The home of the Independent Wrestling Hall of Fame will share the same location as the St.Louis Wrestling Hall of Fame at the South Broadway Athletic Club. 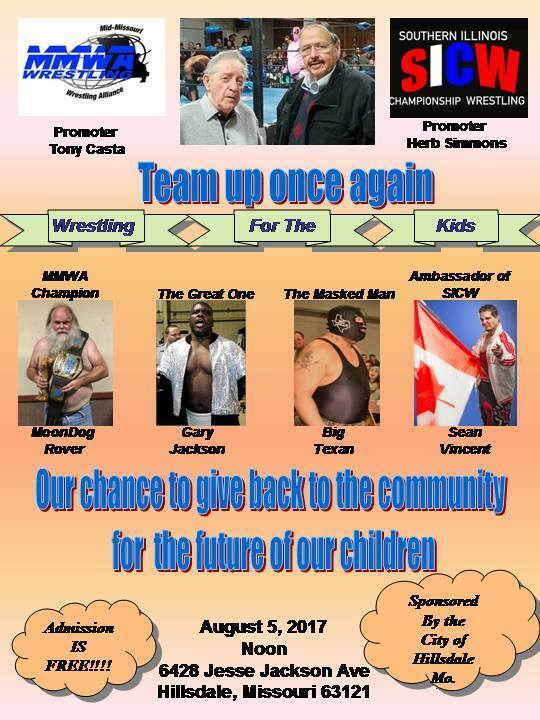 There are many local men and women who have worked in the ring and developed their skills in the independent wrestling business. 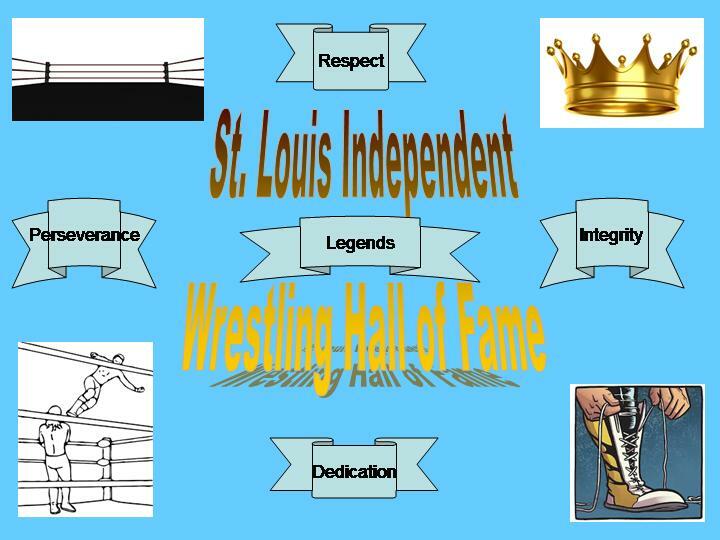 A committee was formed and will be developing the criteria each year to be considered for induction into the St.Louis Independent Wrestling Hall of Fame. 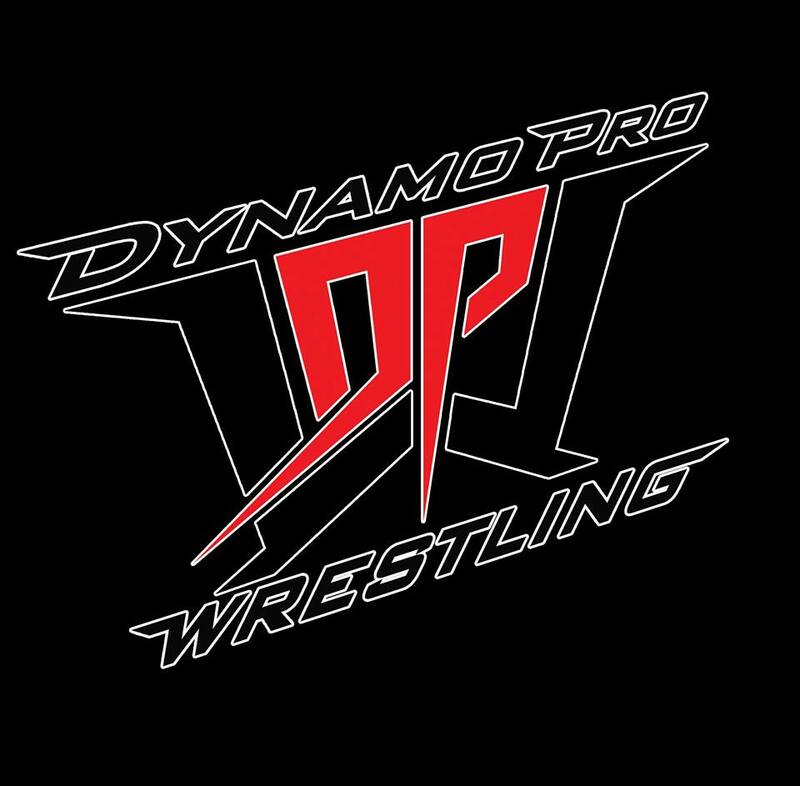 Please continue to follow this page and please support Independent Wrestling. 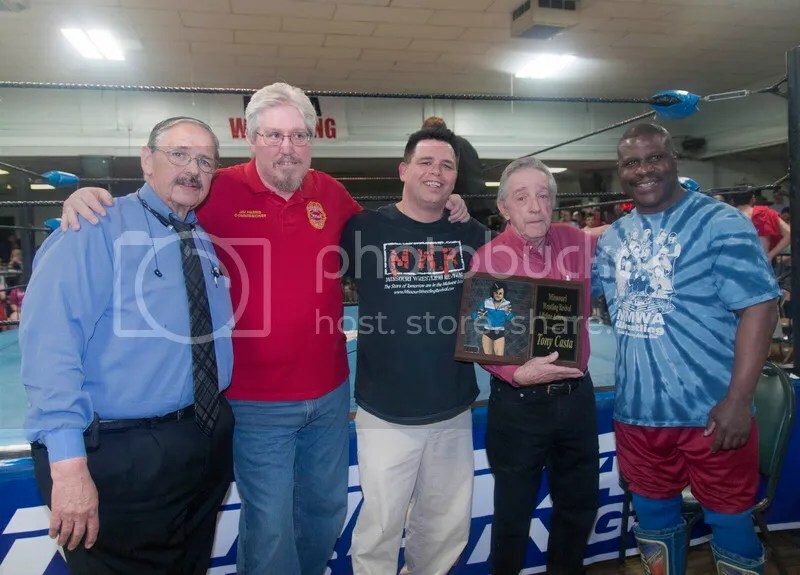 During the MMWA “King of Cable” Tournament at the historic South Broadway Athletic Club in November, the Missouri Office of Athletics supervisor, Ed Moynahan, presented Awards of Excellence to a few that have made an unselfish contribution to pro wrestling. First was wrestling promoter Tony Casta and his wife Wanda. Tony wrestled and then promoted for 28 years. 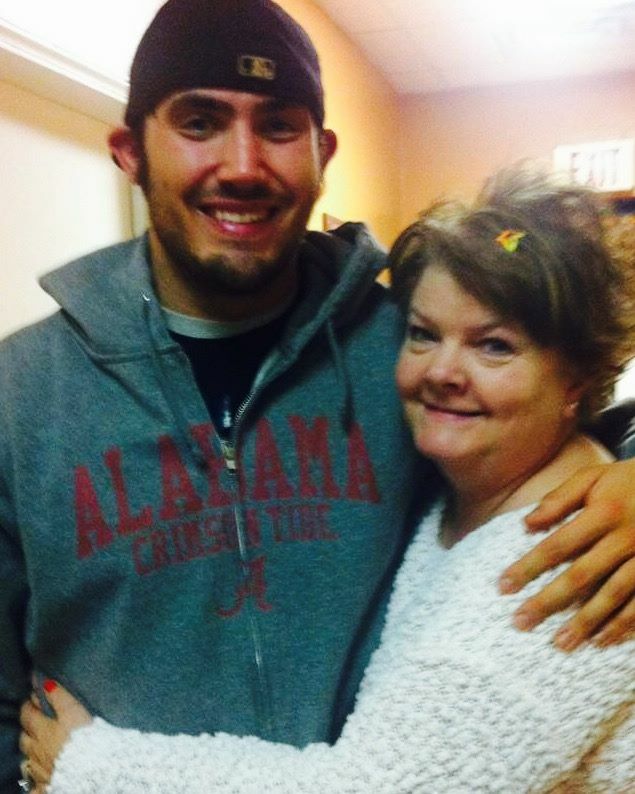 When fans purchase a ticket for South Broadway wrestling, one of the first people they see is Wanda. 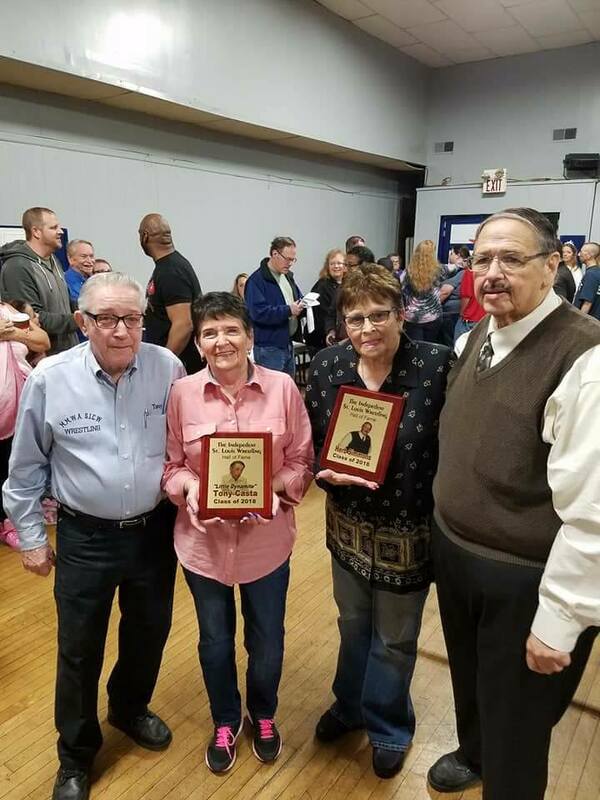 The MMWA at the SBAC is a tradition for many young and old, and Tony and Wanda are vital to the success that pro wrestling continues to have. Senior Referee Jim Harris has been on the job for 27 years. 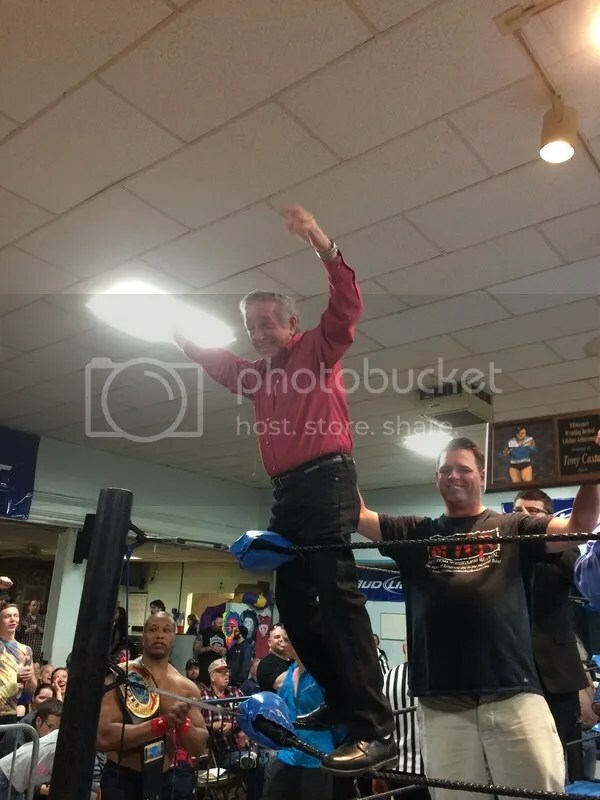 Harris began his training with Rick Roberts and the Masked Executioners, and took in as much advice from former Wrestling at the Chase Referee Ed Smith. Harris has the respect and admiration from his peers, wrestlers and fans for his utmost integrity and dedication to his profession. To many, “The Great One” Gary Jackson is St. Louis Wrestling. The former military veteran made his mark in the Midwest and made appearances in WWE and WCW. 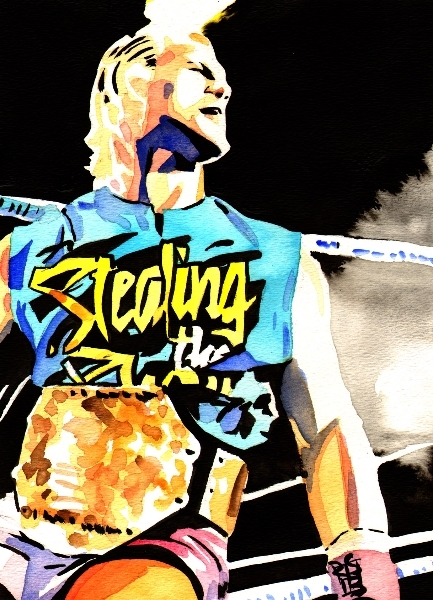 He continues to main event cards and capture titles in exciting matches each month. Gary Jackson is everything that a champion needs to be: hardworking, professional, and always there for the fans. The Lumberjacks Abe and Gabe have been a staple of pro wrestling in the Midwest for the past 25 years. They stand 6’4 and 6”3 respectively and weigh a combined 600 pounds. 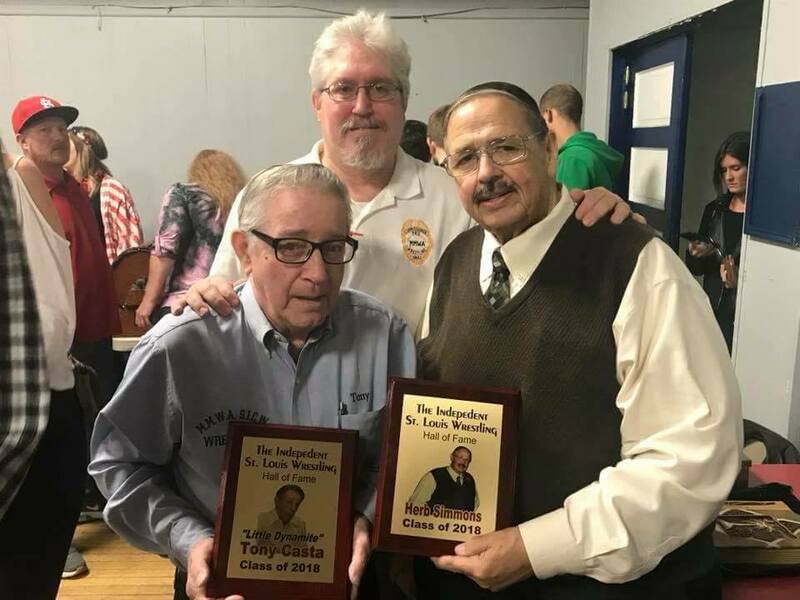 They have been inducted into the Missouri Wrestling Hall of Fame and are the one the most decorated tag teams in the Midwest. Ron Powers shoots on Gary Jackson, Chris Hargas,Ben Simon, Herb Simmons, Larry Matysik and the MMWA-SICW . To hear CWC Champion Ron Powers talk he has swept the competition away in 2011. 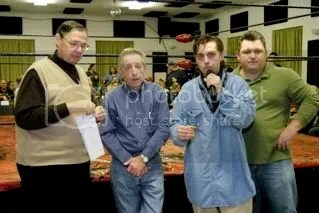 The most feared man in St Louis Ron Powers has been on a rampage in 2011 causing fear and anger among fans and wrestlers alike. 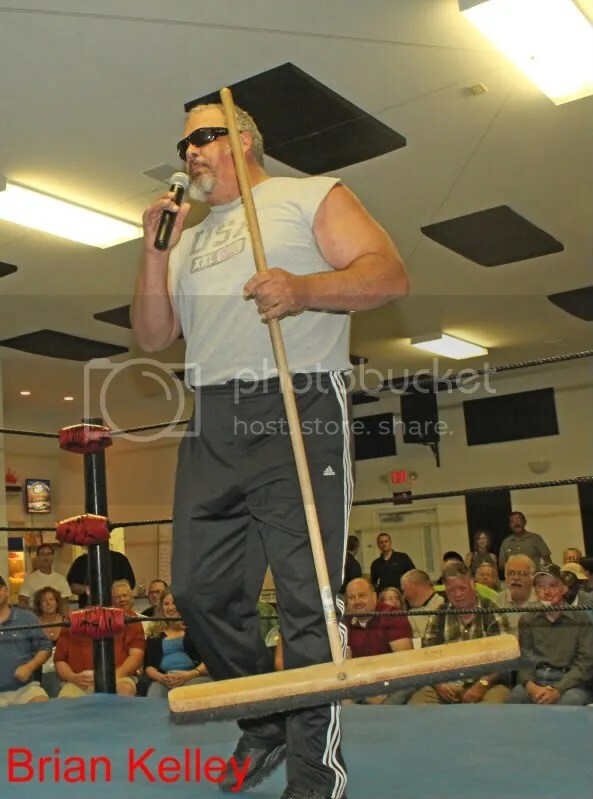 During the past year he has challenged promoter Herb Simmons and the wrestlers of MMWA-SICW. 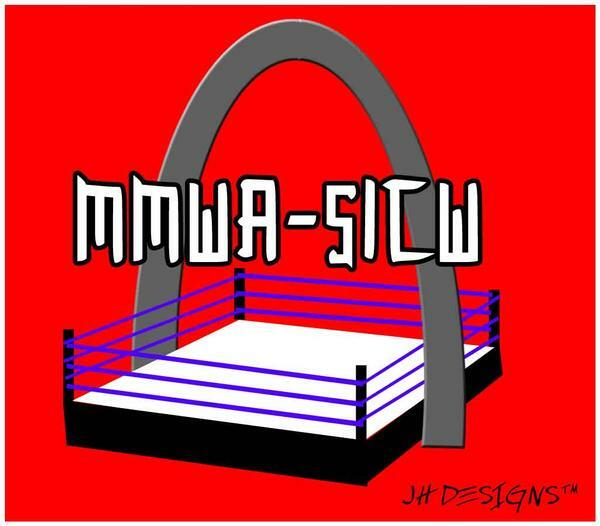 For the fans that do not know there has been rumors that MMWA-SICW have been split in two different promotions. Though several of my close friends within the company claim this to be a fact, until promoters Tony Casta or Herb Simmons tell us themselves we are still viewing them as a single brand. We start of with a reply from our friend Ben Simon, the former ring announcer from the SICW brand who is also the producer of ST LOUIS Wrestling on youtube. Ben replies on the story that MWR printed recently titled “Ron Powers to meet Chris Hargas and continues to warn MMWA-SICW ” and you can check it out here. For the record the misspelling was indeed my fault (Editor and Owner Brian Kelley) as I was writing down his quotes over the phone fromm Powers and when I set them to print I made the mistake. Ben Simon was one of the men that signed up for the MMWA-SICW open tryout. 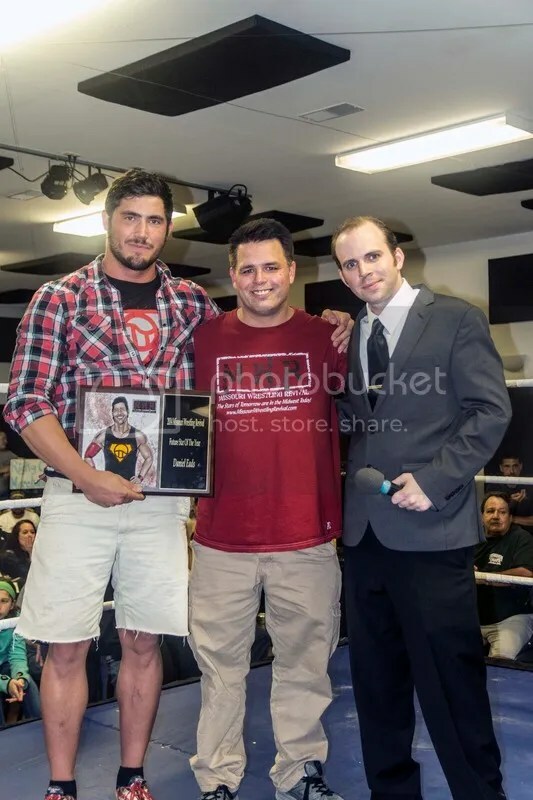 During it one of the men he interviewed was one of the top young talents in Central Illinois Blake Steel. With that said let us start with Ben Simons reply to the CWC Champion on that post at MWR. I take issue with Ron Powers commenting on the MMWA at South Broadway, only since it was SICW that wanted to break away. Ron is the SICW Classic Wrestling Champion (who apparently can’t spell the name of his title correctly). Ron is not the MMWA-SICW kingpin! He rules Southern Illinois Championship Wrestling. However, the doors to the South Broadway Athletic Club are wide open. Ron, put your money and your anger issue where your mouth is and fight the MO/IL Heavyweight Champion, Gary Jackson. I have watched these two great athletes in action and I have no doubt that “Gorgeous” Gary would knock the daylights out of Powers. Mr. Simmons, Mr. Matysik, TEAR DOWN THIS WRESTLING WALL! It would not be long for word to get out to Ron Powers who was quick to respond. Ron Powers does not leave any words left unsaid. He has been a bully in 2011 while taking out his good friend Danny Boy for the title then targeting each and every legend that Herb Simmons can find. First of all, Ben, you’re a dipshit. I don’t lay the format out for the articles. Did you ever think there are more people involved with the MWR website than just me? I know what my title is, and we know what yours is, a Jabrony. I want you to take issue with everything I say, and everything I do, because you are stupid enough to buy it. As far as Gary goes, He is a great athlete, and has very entertaining promos. But as long as I’m around, he will always be second best. As far as the “open doors” at South Broadway, I don’t think so. The reason SBAC’s doors are open, is because nobody wants to wrestle there. Don’t you get it? You seem to be the only person from SBAC who even cares. And we all know how much you care. You’re the first one in the dressing room, and the last one to leave. You also mentioned Benny, about tearing down “this wrestling wall”. Again, dumbass, get the story straight. The only people who built this wall, was all you idiots at South Broadway. Don’t EVEN compare yourselves to us! Hey, great Rhino match by the way. It sounds like the fans really got their money’s worth on that one. This is what I’m saying. You guys couldn’t coordinate a two car funeral. Broadway had great potential at one time. However, the loony’s took over the asylum. It’s an abyss of self-absorbed egos. If anyone has an issue with this, come see me at a real show this Sat. night at East Carondolet. And last but not least, Herb and Larry. I hear you guys are passing around Pat O’Conner tapes. Could these tapes consist of a certain sleeper hold? Could you two be up to something again? Let me tell you this, it will not work on me. I have never been put to sleep by anyone in this business, and I won’t be. I don’t know what “victim” has learned this move, but it will not work on my 19″ neck, I guarantee you. Chris Hargas calls out the fans for support this weekend in East Carondelet. This Saturday night, at East Carondolet, Chas Wesson and Chris Harges, you two will know what it’s like to step between the ropes and fight for your lives, when you take on me and (Sean) Vincent. Herb, you said you would find someone to take me out one day. This Saturday will not be the day! This weekend Chris Hargas has a chance to meet Ron Powers in East Carondelet to see if he can withstand the champions onslaught. 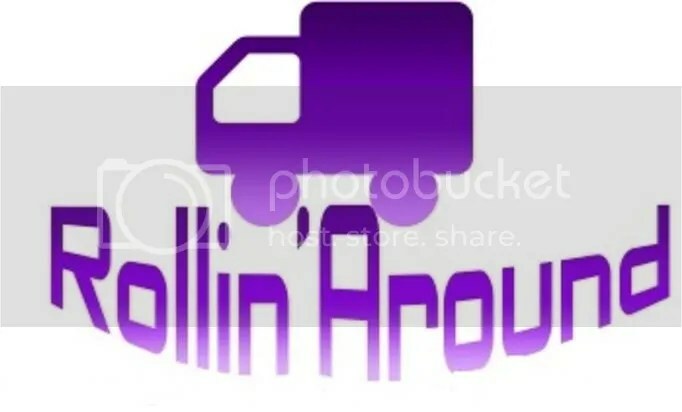 Chris Hargas be prepared as the Midwest Bully, the Kingpin of MMWA-SICW Ron Powers is in no mood to play around as he has even called out the great beloved ST Louis wrestling announcer Larry Matysik. Will Ron Powers continues his reign of terror this Saturday??? ?….Be there. Photo Credit: Mike Van Hoogstraat. The Big Texan (w/ Travis Cook) defeated Lumberjack Abe at 10:34 by pinfall after the big splash. Blade defeated Waco by pinfall at 12:26 following the faceplant. AJ Williams defeated Bobby D by pinfall at 7:44 following the superkick to retain the M0/IL Jr.Heavyweight title. Keith Smith, Danny Boy & ‘Gorgeous’ Gary Jackson defeated Shaft, Dave Vaughn & MMWA-SICW Heavyweight Champion Phil E. Blunt (special referees Tony Casta & ‘Big’ Jim Brown) in a 6-Man Tag Team Elimination Match at 32:50 when Smith finished off Shaft with a UFC-style leglock. After the match, the entire Connection attacked Smith ruthlessly (Jackson was eliminated early on in the match and was in the shower preparing to leave) in the ring. Danny Boy had his hands full but the former Champion did overcome the bad guys and save Keith. 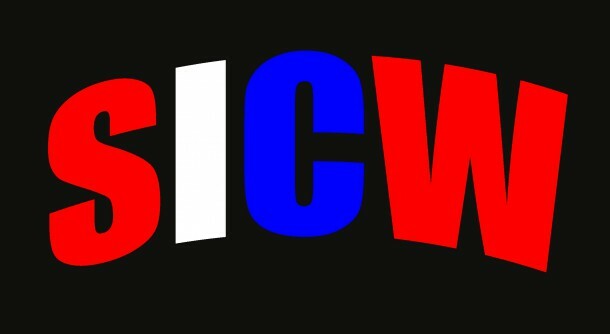 It was also announced by new Commissioner Tim Miller that, as part of the 25th Anniversary Celebration of MMWA-SICW on television, an event of start-to-finish cage matches is being planned for this fall… stay tuned! Do not miss MMWA-SICW when they return to South Broadway this Saturday.